Call 07767 302605 Today to Book this Unique Show for Your Venue! After a lot of meetings, telephone calls and hard work, we’ve done it! The brand new site is now live! We are still building the final content, but in the meantime, if you have any questions, please get in touch! I’d like to take this opportunity to thank my talented promotional team at Hypnotic Consultants for the new site which is based on the show poster, and will feature show dates, regular news, and even more information on the act, and also my Hypnotherapy Clinic. So whether you are the manager of a great venue, or hosting an event, and are looking for an original and funny variety show to entertain your guests, or perhaps you want to stop smoking, lose weight or beat a phobia, enjoy the site, and get in touch! 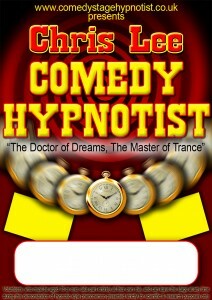 Chris Lee is a Comedy Stage Hypnotist, based in Yorkshire, UK, available for shows Nationally and Internationally.